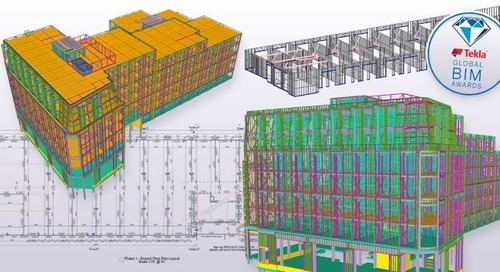 Finnforest Modular Office (FMO) in Tapiola, Finland, was detailed and built utilizing Tekla’s advanced 3D design and modeling technique. The unique 5-storey and 13,000 square meter building is the tallest wooden office building in Europe, consisting of thousands of both prefabricated and separately worked wooden parts as well as stiffening steel wire nets and precast concrete elements. 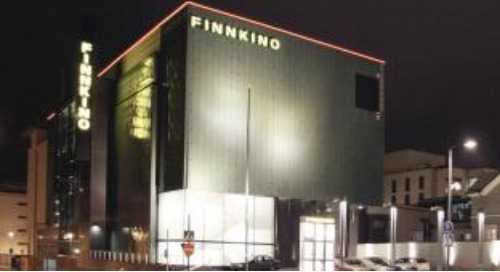 Finnforest modular office is owned by the Tapiola Group and located in the city of Espoo in Finland’s capital region and is the highest wood building in Europe. The implementation of the 20 million euro building project was the responsibility of Europe’s largest corporation in the wood products industry, Finnforest plc (Metsäliitto Group). The office building was inaugurated in September 2005. The aim of the project was to prove the competitiveness of good old wood as building material, which it very well did. 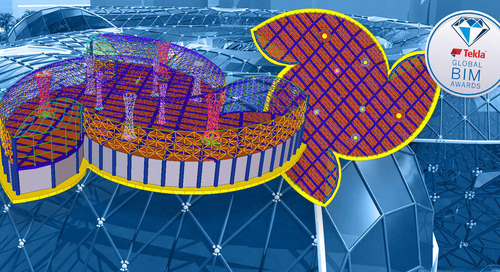 The structural design of FMO Tapiola was carried out with Tekla Structures software. Completed in the summer of 2005, the highest wood-structure office building in Europe is a tour de force in wood construction and a true landmark attracting attention in wide circles. The professional community followed the project closely, and the public was also very interested in it. In addition to an ecological office solution, the modular office provides a close-to-nature, healthy and safe yet modern work environment. The starting points for the project were indeed unconventional use of wood, the life-cycle properties and environmental effects of the materials, energy efficiency, indoor climate, as well as the lighting and acoustics effects. The FMO concept makes it possible to design individualized wood-structured office buildings utilizing a modular frame system, a convincing demonstration of the opportunities that wood offers, particularly as a material for structural frames and facades. The approach is all-embracing as it extends to the interior premises, which can be divided and adapted with flexible partition and acoustic structures. Finnforest Modular Office is a response to the ever more challenging life-cycle and eco-efficiency demands of the industry. Besides that, wood is the only renewing construction material in the world. The FMO building was designed by Helin & Co Architects, whose Sydänpuu (heartwood) proposal won the architects’ competition; it was structurally engineered by WSP Finland and constructed by PEAB Seicon. Facades and intermediate floors feature Finnforest’s own elements, such as split glulam panels, ThermoWood® cladding, and stressed-skin panels made of Kerto wood. The entire project was thoroughly documented from start to finish and will offer a wealth of information for future projects. The trick is not how to construct an office building out of wood but how to take different elements and shape them into a functional entity. Wood-based solutions together with concrete and steel require special expertise to carry out. As wood technology has not been utilized in this magnitude previously, the entire project was a learning process to all parties. There were a great number of subcontractors involved and the co-ordination effort was considerable. What made things somewhat easier, however, was the role of Tekla Structures in the detailing and modeling of the building. 3D planning in this case presumed significant development work in order to be able to efficiently model the new kind of wooden elements with their connections. 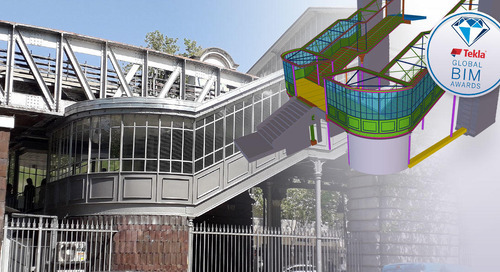 Involved in modeling were WSP engineers from two different offices, for which Tekla Structures’ multi-user functionality was found particularly useful. They successfully utilized Tekla’s advanced 3D building information modeling (BIM) solution, which is an information management process where a building of any size, material or complexity can be virtualized in detail with every nut and bolt in place. In addition to completeness at a virtual level, Tekla BIM is based on interdisciplinary collaboration and commitment as well as interoperability of related software applications, such as architectural and analysis and design software. These are the elements that can make even the most challenging project, like FMO Tapiola, a success story. Structural data only needs to be input once, after which the software effectively enables e.g. the use of custom components, clash checking and change management, and lets all project participants share all necessary information in an illustrative 3D model. FMO Tapiola’s structural design was WSP Finland’s first wood project implemented with 3D modeling. 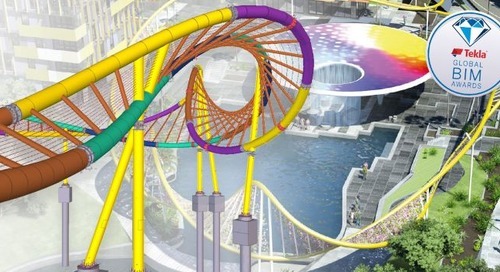 The design project carried out with Tekla Structures was launched toward the end of 2003. 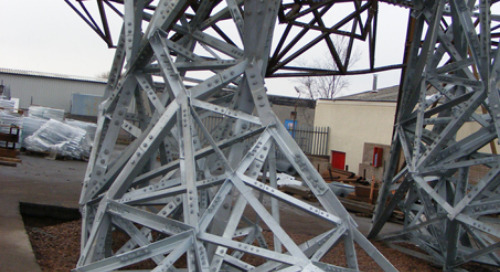 “We’d already been using Tekla Structures to model all our steel structures for some years and we’re also using the same system to an increasing extent for concrete structures. This was the first time we used Tekla Structures for wood,” says Ville Jaatinen, the design project’s project engineer. In Jaatinen’s view, designing complex wood structures worked out extremely well. The 3D model was also successfully utilized to produce part, assembly and dxf drawings as well as a considerable number of reports to enhance production. “I believe we were able to significantly cut down on errors by using 3D modeling and certainly improved the quality of building compared to the alternative of designing in a traditional 2D environment. Even though there were truly difficult structures and complex details, I never heard of a single problem on site,” Jaatinen says. WSP's Ville Jaatinen considers wood to be in a world of its own compared to more familiar building materials. In the design project it brought a change of perspective, starting from dimensioning. “This was something brought to the fore with structures like glulam, which can be regarded as one or many objects at the same time. For example, we ended up defining two different kinds of holes for connection pieces: holes with a onemillimeter tolerance for steel parts and holes with a zero millimeter tolerance for wood parts,” Jaatinen describes. A lot of thought was put into how the various entities and subentities would be best viewed. 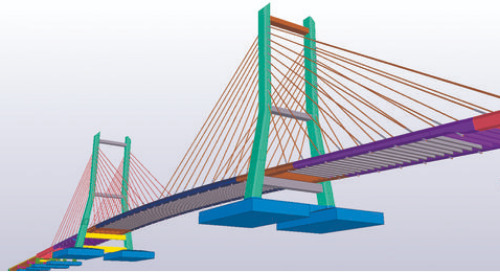 The latest features of Tekla Structures, such as a drawing classifier and printing wizard, were utilized extensively. “Notches, for example, were modeled as correctly-dimensioned notch material and the related texts were imported to assembly drawings based on material and length. In addition, the wizard was used to import a lot of neighbor parts to the assembly drawings to help fasten connecting pieces at the factory,” explains Jaatinen. 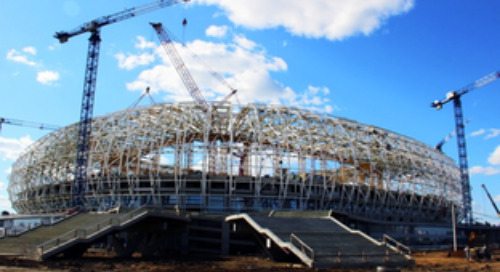 Jaatinen has found that more recent versions of Tekla Structures provide increasingly better means for solving many of the challenges encountered during the FMO Tapiola project. “We would have had a lot of use for the option to define varying finishes on a part’s different surfaces as is possible with newer versions. It would significantly enhance work with edge-laminated beams. Another useful improvement is the custom component function which was still under development in the Tekla Structures version used for the project. I’m sure that the custom components currently available are already applicable for connections, too,” Jaatinen says. For the project’s structural designers, FMO Tapiola proved to be a fascinating project that provided diverse new expertise related to wood structures and their modeling. “We’ll be much better equipped in the next project. When similar wood projects are implemented, I’m in no doubt that Tekla Structures will be brought into play again,” Jaatinen concludes.